If you’re a fan of listening to students, factory workers and prison guards battering cover versions of classic ballads on primetime TV, you’ll probably be itching to get your mits on slot developer Ash Gaming’s online slot dedicated to everyone’s favorite talent show: X Factor. A 5-reel, 20-payline slot, X Factor is actually based on older British versions of the television series, but we do at least get Wagner (remember him? ), Matt Cardle, Jedward and some other singers whose names have already escaped you once you start playing. As well as various singers and groups on the reels there are Gold Disc symbols, regular 10-through-Ace icons, and the X Factor logo, while the official theme tune introduces the shebang, and the official presenter launches proceedings. But if the excitement of the show isn’t enough, there are also two bonus rounds and three progressive jackpots to be had. The X Factor logo acts as the game’s Wild and substitutes for all regular symbols other than the Scatter. Five Wilds across the reels pays a tasty jackpot of 10,000x your line bet, and with a max. line bet of $10, that makes a very nice haul indeed. Bonus rounds are what this game is all about – that’s if you can hit them, of course. There are two bonus features in X Factor, both of which are tricky to hit, but when you do you’ll be counting the dollars. 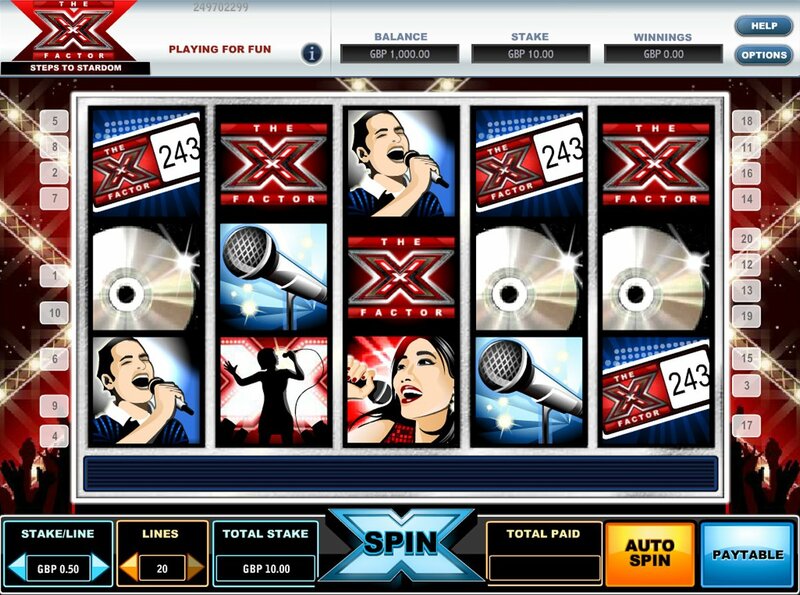 The Live Show Bonus Round is triggered by hitting three X Factor Bonus Scatters on Reels 1, 3, and 5 simultaneously. The bonus game is divided into 10 levels – or competition ‘weeks’ – with famous contestants picked from past series of X Factor. Simply select on ‘yes’ or ‘no’ whether you think the contestant will make it through to the next week. Two ‘yes’ votes result in a deadlock which means you will need to get the public vote to progress to the next round. Your payout depends on how far you get in the competition, with Weeks 3 and 4 receiving a 2x multiplier, up to Week 10 – the Grand Final – which has a 50x multiplier attached on any cash prizes. There’s more bonus action to be had by hitting the microphone Scatter on Reel 3. 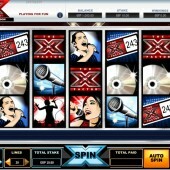 It will launch a Click Me bonus round where you get to choose from three X Factor contestants. Choose one and win a prize. Finally, hit three CD Scatters on Reels 2, 4 and 5 and you’ll trigger the game’s free spins bonus round. Each CD Scatter will reveal a number, and the total tells you how many freebies you get. Next, the X Factor logo whooshes across the reels. Each position the logo lands on turns Wild and will stay there until the end of the free spins round. There’s a sweet progressive jackpot to be had here too. Look out for the Telephone icon at the end of the bonus round: four symbols gets you the bronze progressive, five telephones for the silver jackpot, and six telephones for the gold progressive. Bonus features are the main selling point of X Factor. While the base game itself doesn’t evoke much of the atmosphere of the TV show – the icons of singers are pretty generic and there’s not much X Factor music, except in the intro and bonus games – music fans and fans of the show should lap it up. The bonus features ARE hard to hit, though. Fans of music-related slots in general should definitely check out another of Ash Gaming’s online slots, Madness House of Fun, while iSoftBet's '80s Night Life is an equally light-hearted slot with a similar pop theme.